All the major technology companies seem to focus on artificial intelligence nowadays and the ways it can be put to good use. Microsoft is one of these companies and its Project Oxford artificial intelligence team managed to deliver a technology that is able to recognize emotions based on facial expressions. Although it might seem a small step towards exploiting the possibilities artificial intelligence has to offer, the fact that a software is able to recognize human feelings and emotions is definitely not an insignificant thing. 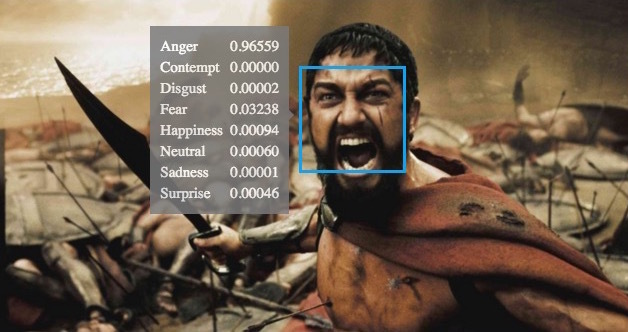 To prove the efficiency of their software, Microsoft launched the Emotion Recognition site, where people can upload their photos or insert an image URL for the software to recognize the emotions their image projects. How does the program decide how happy or sad you are in a photo or what other kinds of emotion is reflected by your face? It uses artificial intelligence combined with facial recognition and then it identifies specific feelings shown in the photos. So far the technology only detects happiness, sadness, surprise, neutrality, fear, anger, contempt, and disgust, but the range of recognizable emotions will probably widen further along the project. The program doesn’t only identify the main emotion displayed, it analyzes the uploaded picture and shows the amount of each emotion conveyed in the photo. Project Oxfords emotion recognition program is also able to identify the emotions of multiple subjects displayed in the same photo. In order to to this, the program really has to be an extremely sophisticated one, but it seems that the team from Microsoft managed to achieve what a few years ago would have seemed absolutely impossible. The program can be put to a great variety of use, from marketing purposes, through messaging apps and the possibilities are almost infinite. Although there is a lot more to do in the research of artificial intelligence and the ways it can be used, the results of Project Oxford are quite impressive. Microsoft’s research team has done a great job so far and we expect more breakthrough results from them and from other tech giants also in the future. Project Oxford is not limited to the emotion recognition software, it also includes programs that are going to interpret words, sounds, and images. It seems that these programs will be released to beta developers later this year. HTC One M9e- The Third Model To Launch on Tuesday? LG G4 Pro, LG V10, both? What should we expect?